Uluwatu temple located in Pecatu village south of Denpasar city and 45 drive from Ngurah Rai airport. Uluwatu temple is one of six major temple in Bali island or one of sad kahyangan jagat of Balinese. Uluwatu come from word Ulu and Watu which is Ulu means head and Watu means stone. Uluwatu temple build on cliff top which is Balinese belief that this temple function as protection for Bali island from evil influences or negative influences. Uluwatu temple built in 11th century and open for public. Small forest will pampered you on the way to main area, called Kereran forest inhabited by hundred of holy monkeys. Uluwatu temple is one of best tourist attraction in Bali island offer beautiful panorama with spectacular sunset and beautiful view of Indian ocean from cliff bank. On left side of Uluwatu tempel there is Kecak dance perfomance every day, start at 6 p.m open for tourist only. Kecak dance is a mass dance perfomance which is describes the role of Rama and Sita based on puppet story. Kecak dance is usually shown in Kerauhan or Mesolah means magically immune so it is not burned by the fire. Kecak dance is unique dance which is not accompanying music or Balinese instrument. Kecak dance performance only combine by the art of sounds mouth, like : cak cak ke cak ke cak ke, so that why this dance called kecak dance. Do you need transport for traveling in Bali island or need transport for airport transfer? Best Bali combination tour Packages which is duration 8 – 10 hours trip to visit Bali Water Sports located at Tanjung Benoa which has a variety of water sport that can simply spur your adrenaline. 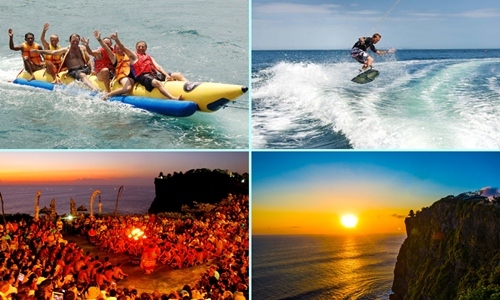 Bali Waterbom and Sunset Dinner tour is exciting Bali short day tour packages which is duration 6 – 7 hours to visit Bali waterbom park and sunset dinner in Jimbaran bay. 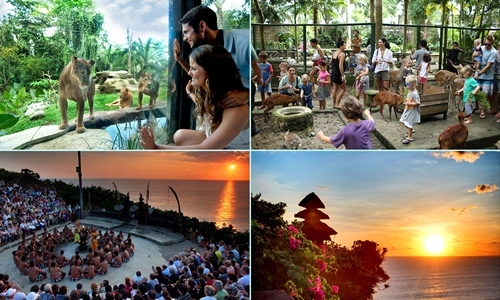 Bali Zoo and Uluwatu tour is an Bali combination tour package which duration 8 – 10 hours. On this tour we will visit Bali Zoo located on Jalan Singapadu, Gianyar regency and one of lush tropical garden with area of 12 hectares. And visit Uluwatu Temple located in Pecatu Village, south part of Bali.